The medicinal effect of the cumquat is effective in damming up and the improvement of various symptoms of the cold. It boils until finely chopping about ten one that the cumquat ripened, and boiling by sugar and the water 500g of the proper quantity. The boiling soup is taken several times a day. It doesn't grow so much by about two meters. It is an oblong in alternate, with 5-7cm in length and the thickness. A white flower of five valves of about 2-3cm in the diameter is put forth several times during about the July-October. 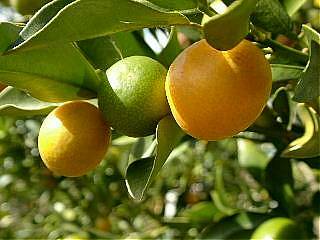 It ripens actually yellow about 2cm in the diameter in around winter since green and autumn. Only each pericarp or the pericarp eats the life though acidity is strong. There is a little bitterness in a part cotton with a white pericarp. It ..pericarp.. boils ..the remainder.., and it makes it to the shochu pickle etc. the syrup pickle, the sugar pickle, the honey pickle, and marmalade. The pericarp contains a lot of vitamins C and hesperidins (vitamin P). It is effective in the prevention of the pain and the cold of the cough and the throat. The season word is autumn. It is not a mandarin orange but it is a cumquat (kumquat). This eats contents and the skins other than the seed. A lot of vitamins C are effective in the prevention of the cold. The diameter is about 2cm in this photograph though it looks large. Even if the proper quantity is drunk, what squeezes the cumquat and makes to the juice is effective. There is a healthy effect even if eating like the mandarin orange because vitamin C of the cumquat is abundant. To brew the cumquat sake, the cumquat about 500g is wet-cleaned and water is drained. This is soaked to the white liquor 1.8 liters. Sugar is taken by the favorite by 200-300g. It becomes delicious when having preserved it in the cool dark place for 2-3 months. About one cup is drunk the glass in a day. It is not very delicious and do not drink sake too much, please. It can eat the soaked cumquat as it is.